Duke forward Zion Williamson has been named the first Atlantic Coast Conference Basketball Player and Freshman of the Week of the 2018-19 season following outstanding performances in his first two collegiate games. ACC weekly honors are determined by a vote of a 15-member media panel and will be announced on Monday throughout the regular season. Williamson averaged 27.5 points, 11.5 rebounds and shot .815 from the field (22-of-27) in leading the No. 4 Blue Devils to a pair of season-opening wins over No. 2 Kentucky (118-84 on Tuesday) and Army (94-72 on Sunday). The 6-7, 285-pound native of Spartanburg, South Carolina, was 11-of-13 from the field for 28 points, seven boards and two assists in just 23 minutes against Kentucky on opening night. He followed that with a game-high 27 points on 11-of-14 from the field with 16 rebounds, six blocks and four assists against Army – Duke’s first double-double this season. 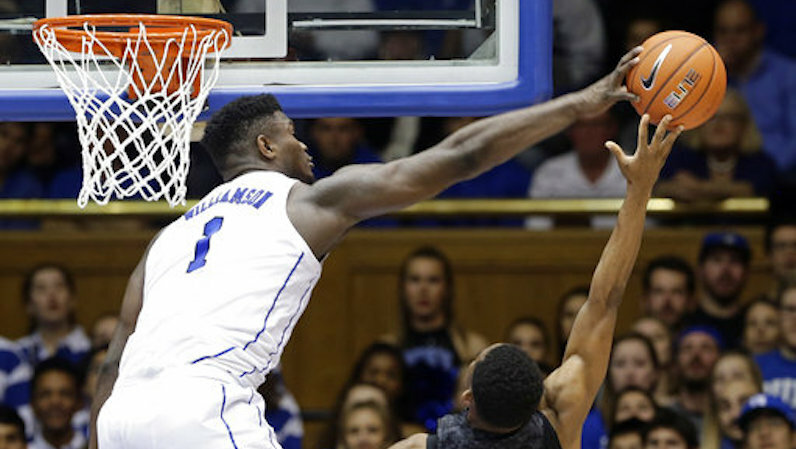 Williamson became the just the second player at Duke, and first under head coach Mike Krzyzewski, to post at least 25 points, 15 rebounds and five blocks in a game (Mike Gminski did it twice). Williamson’s 55 points are the second-most by a Duke player (regardless of class) through the first two games under Krzyzewski – only the 56 by his current teammate RJ Barrett are more.